I think Senator Rand Paul’s aversion to going to war with Russia over Montenegro just triggered Senator John McCain. While speaking from the Senate floor in support of a bill advancing the country of Montenegro’s bid to join NATO Senator John McCain anticipated opposition from Rand Paul, as McCain requested unanimous consent for the bill. It's time for Juan to get his meds adjusted. 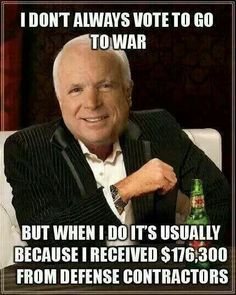 McCain should be subjected to the same sanction. I agree with all above comments, McCain has outlived his usefulness and when he utters nonsense like this it make me think perhaps he's outlived his own brain. And recall the Senate has rules about speaking ill against a fellow Senator. We recently witnessed this rule being enforced when Hiawatha Warren attacked Jeff Sessions. Yes, I thought that the same rule should have applied.... but of course mclame is a member of the protected class.